Hi, my name is Paul Tomaszewski and I live in Montreal, Canada. I am really passionate about history, technology & science – especially astronomy! Happy Feasts of the Polish Armed Forces and of the Assumption of the Virgin Mary Into Heaven! Today in Poland and the Polish diaspora we celebrate two feasts which are more connected than you might think. What do the Polish Armed Forces have to do with the Assumption of the Virgin Mary into Heaven, you might ask? To answer that, let’s start by a brief history of the origins of the Feast of the Polish Armed Forces (also known as Armed Forces Day or Święto Wojska Polskiego in Polish). It commemorates the anniversary of the 1920 victory over Bolshevik invaders at the Battle of Warsaw during the Polish–Soviet War. That victory is so significant for the history of the world that many historians count it among the most decisive battles of the world. The Viscount D’Abernon names it as the eighteenth most decisive battle of the world and Fuller, J.F.C. lists it in his book “The Decisive Battles of the Western World”. Why was that battle so important? After a successful revolution in Russia which started in 1917, the Bolsheviks were planning to invade the rest of Europe to spread the revolution. That plan was not as far-fetched as you might think because the Bolsheviks had a lot of sympathizers in Germany after its defeat in World War I. So what stood in the way of a world-wide Bolshevik revolution? You guess it! – Poland. It wouldn’t be the first time, given that Poland has a long history of shielding Europe from such invasions: the Mongols or the Ottomans to name a few. After initial successes against the Bolsheviks in 1919, the next year wasn’t going so well and the Bolsheviks were gaining ground until they reached Poland’s capital city, Warsaw. Things were looking bleak and the world’s indifference was not helping either (with one notable exception, the Hungarians were sending help in the form of weapons and volunteer soldiers.) Everything seemed to point to the inevitable fall of Warsaw, but then it happened – the battle that saved Poland and the world, which would later be known as the “Miracle at the Wisła” (Polish: “Cud nad Wisłą”). This brings us to the connection with the feast of the Assumption of the Virgin Mary into Heaven. It is my belief that it wasn’t a coincidence that such a victory happened on that special day. After all, the Blessed Virgin Mary is Queen of Poland, since king John II Casimir Vasa entrusted Poland under her protection and announced her as The Queen of the Polish Crown during the Lwów Oath in 1656. 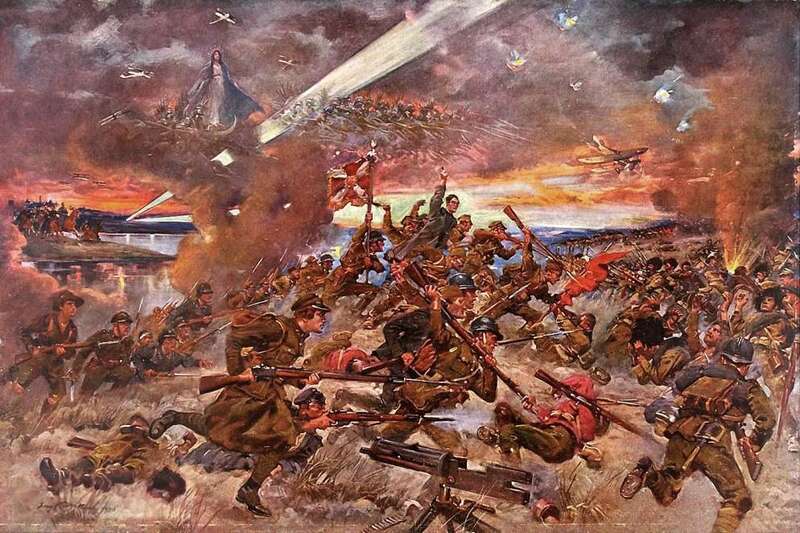 That connection with the Virgin Mary as protector of Warsaw during the battle was portrayed by Polish painter Kossak in his famous painting, which I had to attach to this post. Continue reading Happy Feasts of the Polish Armed Forces and of the Assumption of the Virgin Mary Into Heaven! Posted on August 15, 2015 October 5, 2017 Categories Faith, HistoryTags Communism, Europe, Poland, Polish Armed Forces, Polish-Soviet War, Revolution, Russia, Soviet Union, Virgin Mary, War, Warsaw15 Comments on Happy Feasts of the Polish Armed Forces and of the Assumption of the Virgin Mary Into Heaven!